With a group of friends, I set off from the main island in a bum-boat to a small islet situated to the north-east of Singapore. As the mainland retreated into a background, the bustling traffic, speeding metros, towering buildings, crowded pathways paved way to a series of undulating, granite hills. 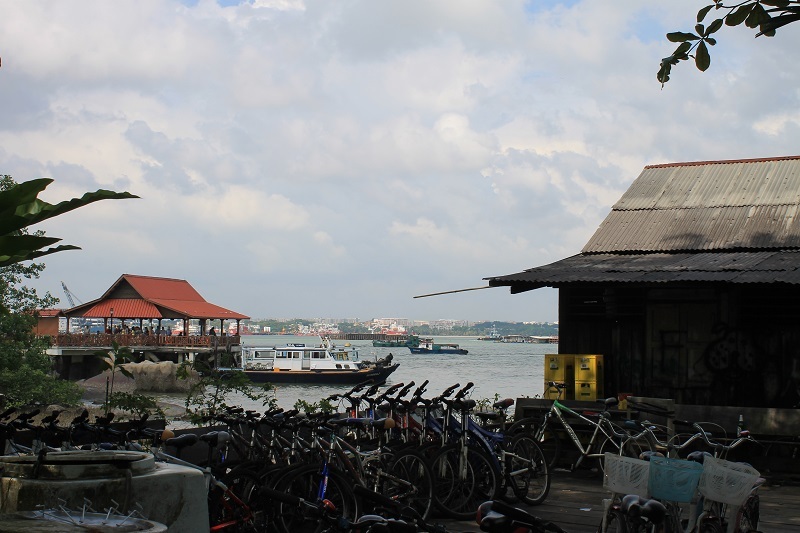 Once housing a few thousand settlers, now Pulau Ubin, the last of Singapore’s villages or Kampongs is a home for just over a hundred inhabitants. 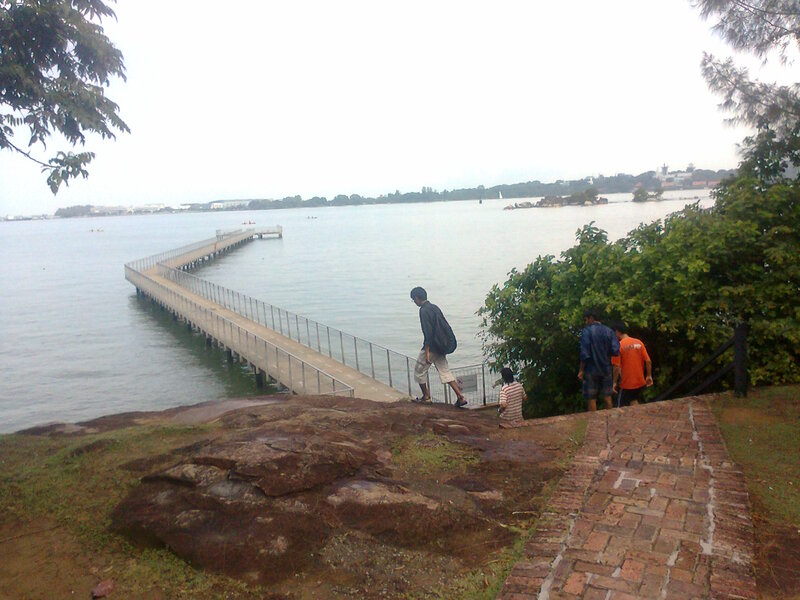 A jetty at the entrance where the boats dock. 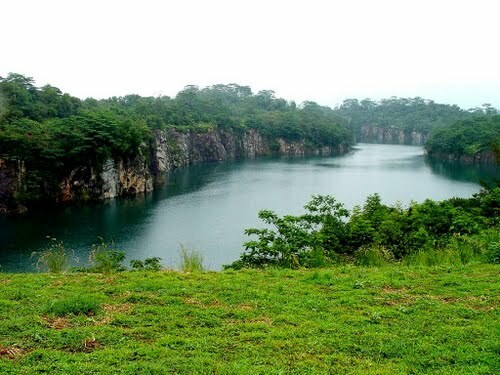 Legend has it that Pulau Ubin was formed when three animals (a frog, a pig and an elephant ) from Singapore challenged each other to a race to reach the shores of Johor (near Malaysia) and the unsuccessful ones turning into stone. Battling many hurdles, the animals failed to reach the shore. Thus, the elephant and pig together turned into Pulau Ubin whilst the frog became Pulau Sekudu (Frog Island). Near the jetty, the main village has rental shops that house a horde of bicycles used to traverse through the island. It was to be my first mountain biking experience here. Hiring bicycles, I set off with my bunch to the Ketam Mountain Bike Park, considered one of the best mountain bike trails in the world. 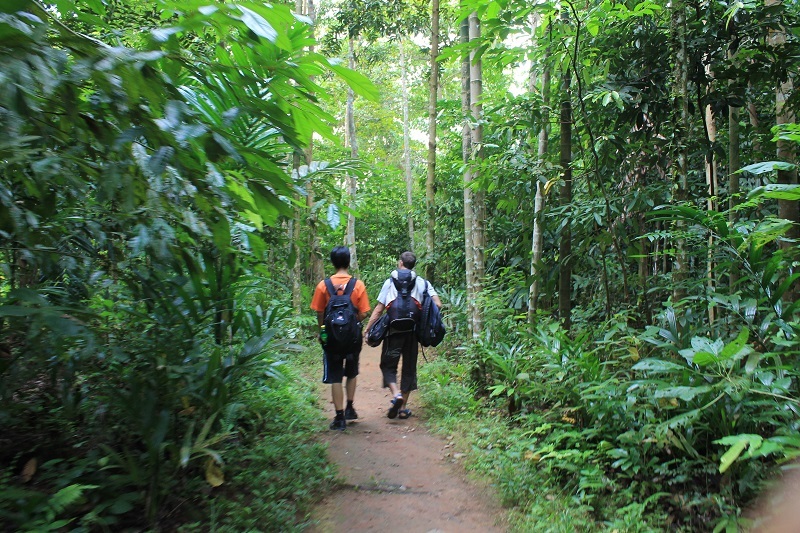 The trail is almost 8kms long and boasts of a wide range of terrain from open meadows to thick jungles, numerous steep ascents and descents with signs en route indicating different levels of difficulty. 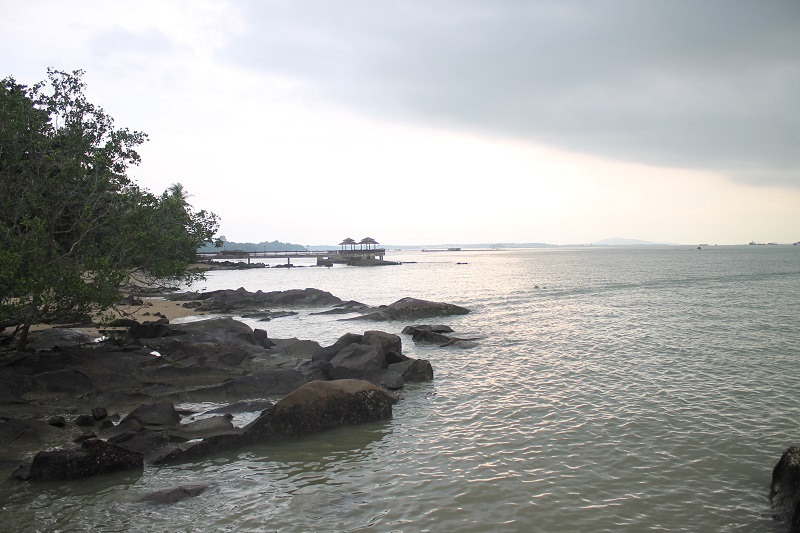 As I completed the trail and headed to explore different parts of the islands, the splendour of Ubin was laid before me. It wasn’t just the dense tropical rain forests. With rain pouring hard on, we got lost at times only to find another path leading elsewhere to another splendid location. 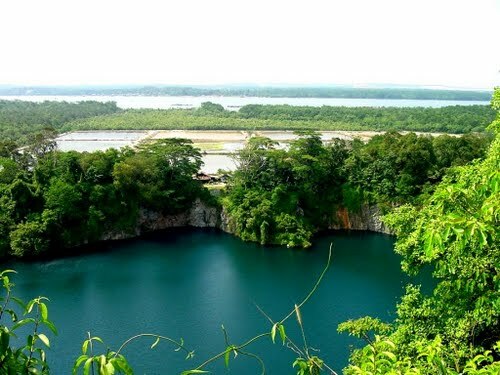 Free from urban development, this island is an abode for rich and preserved wildlife, abandoned quarries, plantations, wooden house villages, wooden jetties, relaxed inhabitants and largely untouched nature. Muddy tracks, stony patches, heavy rains, thick jungles- it did take us to a different land indeed. The granite outcrops are particularly spectacular from the sea because their grooves and fluted sides create furrows and ridges on each granite rock slab. Witnessing traditional farming, fishing, floating houses, encountering wild but mild boars, watching birds that I have never seen before, I rode past on and on. Moving on, we went ahead to the Chek Jawa wetlands. It’s said to be a coral reef about 5000 years ago and even today it remains largely unscathed, with a variety of marine wildlife like the Seahorse, Sea hares, Sea squirts, octopuses, Starfishes, Sand dollars, various fish and sea weed. We rested on a jetty near the wetlands and watched the shores of the busy mainland of Singapore. 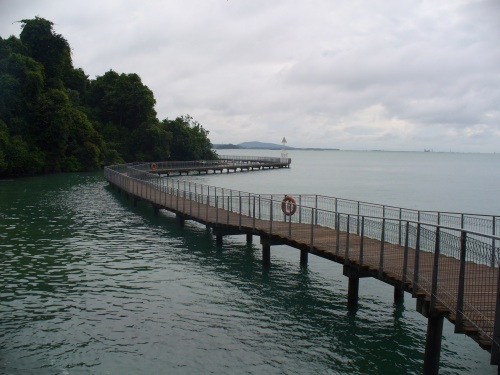 Chek Jawa board-walk that runs through the mangrove, allowing visitors to observe the plant and marine life at close range. As the evening slowly set in, the last of the bum-boats blew its horn a little too loudly. We hurried back to avoid being stuck in the jungle overnight. As the boat set off, the rain, that had eluded us over the evening came lashing down. Another moment to add to the epic day- we climbed on top of the boat, feeling the rain pound on the face as the boat sped towards the shores of the mainland. Great pictures, very bucolic! 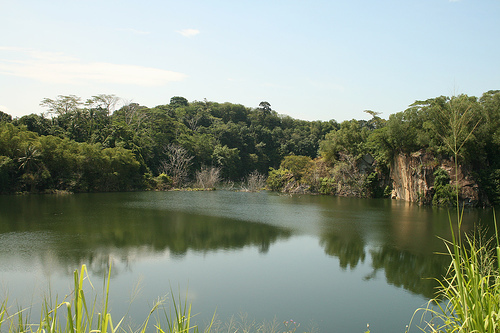 I’ve been to Singapore numerous times and yet haven’t even heard of Pulau Ubin! I must make a special effort to go the next time I’m there. Yeah it is indeed worth a visit. 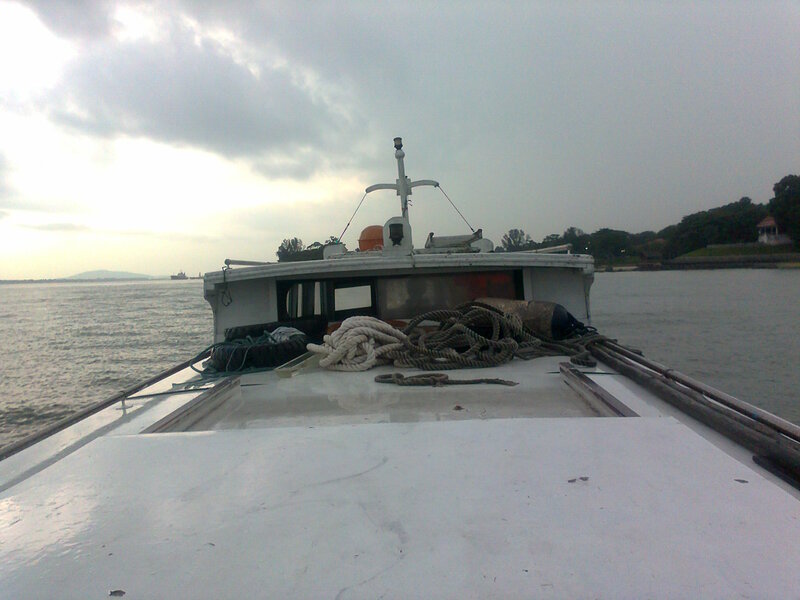 You can easily take a boat from Changi Village to the island. Some pictures are of lesser quality because it had rained so hard that I was apprehensive about taking my camera out.